Step 1: Define the problem that you would like to solve. This is the “what” step, where you figure out what problem you are intending to solve. 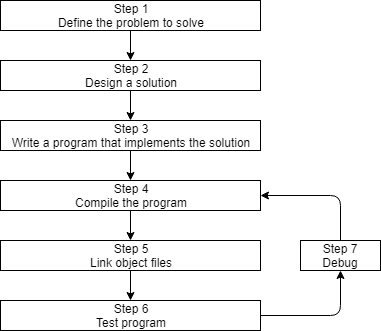 Coming up with the initial idea for what you would like to program can be the easiest step, or the hardest. But conceptually, it is the simplest. All you need is an idea that can be well defined, and you’re ready for the next step. Step 2: Determine how you are going to solve the problem. This is the “how” step, where you determine how you are going to solve the problem you came up with in step 1. It is also the step that is most neglected in software development. The crux of the issue is that there are many ways to solve a problem -- however, some of these solutions are good and some of them are bad. Too often, a programmer will get an idea, sit down, and immediately start coding a solution. This often generates a solution that falls into the bad category. They are straightforward (not overly complicated or confusing). They are well documented (especially around any assumptions being made or limitations). They are built modularly, so parts can be reused or changed later without impacting other parts of the program. They are robust, and can recover or give useful error messages when something unexpected happens. When you sit down and start coding right away, you’re typically thinking “I want to do _this_”, so you implement the solution that gets you there the fastest. This can lead to programs that are fragile, hard to change or extend later, or have lots of bugs (technical defects). The term bug was first used by Thomas Edison back in the 1870s! However, the term was popularized in the 1940s when engineers found an actual moth stuck in the hardware of an early computer, causing a short circuit. Both the log book in which the error was reported and the moth are now part of the Smithsonian Museum of American History. Studies have shown that only 20% of a programmer’s time is actually spent writing the initial program. The other 80% is spent on maintenance, which can consist of debugging (removing bugs), updates to cope with changes in the environment (e.g. to run on a new OS version), enhancements (minor changes to improve usability or function), or internal improvements (to increase reliability or maintainability). Consequently, it’s worth your time to spend a little extra time up front before you start coding thinking about the best way to tackle a problem, what assumptions you are making, and how you might plan for the future, in order to save yourself a lot of time and trouble down the road. We’ll talk more about how to effectively design solutions to problems in a future lesson. In order to write the program, we need two things: First we need knowledge of a programming language -- that’s what these tutorials are for! Second, we need an editor. It’s possible to write a program using any editor you want, even something as simple as Window’s notepad or Unix’s vi or pico. However, we strongly urge you to use an editor that is designed for coding. Don’t worry if you don’t have one yet. We’ll cover how to install a code editor shortly. 1) Line numbering. Line numbering is useful when the compiler gives us an error, as a typical compiler error will state: some error code/message, line 64. Without an editor that shows line numbers, finding line 64 can be a real hassle. The examples we show in this tutorial will always have both line numbering and syntax highlighting to make them easier to follow. 3) An unambiguous font. Non-programming fonts often make it hard to distinguish between the number 0 and the letter O, or between the number 1, the letter l (lower case L), and the letter I (upper case i). A good programming font will differentiate these symbols in order to ensure one isn’t accidentally used in place of the other. In C++ your programs will typically be called name.cpp, where name is replaced with the name of your choosing for the program (e.g. calculator, hi-lo, etc…). The .cpp extension tells the compiler (and you) that this is a C++ source code file that contains C++ instructions. Note that some people use the extension .cc instead of .cpp, but we recommend you use .cpp. Name your code files name.cpp, where name is a name of your choosing, and .cpp is the extension that indicates the file is a C++ source file. Also note that many complex C++ programs have multiple .cpp files. Although most of the programs you will be creating initially will only have a single .cpp file, it is possible to write single programs that have tens or hundreds of .cpp files. Once we’ve written our program, the next steps are to convert it into something that we can run, and then see whether it works! We’ll discuss those steps (4-7) in the next lesson. This tutorial is very comprehensive and all what you need as a beginner programmer like me. I was actually reading a book on c++ when I came across "composition" which the author did not explain extensively. So I decided to browse for the topic online and finally found myself in your website. In fact, your teaching style is so mesmerising that I have to abandon the book and continue with your tutorials. Youy way to teach is really awesome! Thank you very much for this lovely initiative! If you have mentioned above that c++ is a compiled language , then why i need to compile my program before running it. The definition of a compiled language is that the code needs to be compiled by a compiler before it can be executed by the computer. Can you make "Dive inn" Topics that we can read from? I need a quick tutorial on how to make a declaratoin. You can use the site index to find specific topics. Well. I'm trying to get how to make a declaration from scratch. And I don't get it, even if I try my hardest. So maybe give people some tips on how to get topics when I read something and I don't get it? Find the article on declarations (using the site index), and leave a comment there with what you're trying to do, and what you've tried that didn't work. I'm sure some nice soul will help. 1. (naive, slow) Find all the files on your PC, then check for those you want to remove and remove them. 2. (pro-active) Make a system service that would look for file creation events and trigger removal program when specific file type is created. 3. (somewhat strange) Modify file system code to make that file type work as if it was free space. 4. (resembling actual solution development) Limit possible folders/locations to reasonable ones (for example, you're probably not looking for .pdf in Windows DLL folders), find out the best time to run such program (for example, if you need to delete temp files that some software creates once a month, you don't need to run removal every second), think about speed and concurrency issues (what happens if you delete the file that your operating system is currently trying to read? Is it a problem for everything else on your PC if you try to delete 1M files simultaneously? ), then check for theoretically possible bugs, then implement solution 1 with all the data you collected. I work in a unix environment with Mac OS X. In syntesis, there's this message of "duplicate symbol _main"
Can you explain it to me in order to fix the files to execute step 5? Can you show us the source code you're trying to compile? It looks like the code files for 2numeri and file both have a function named main. A program can only have one main function. If you mean programming language, sure. You can write your own language, develop a parser that converts it into C++ (or some other language), and then use an existing compiler for that language to compile it. If you mean compiler, yes, but this is a lot more complicated. I wouldn't even try to do this. Hi there Mr. Alex, first of all, many thanks for creating these lessons. I have faith that they will turn out very useful (i.e. They will actually work). However, I have a yearning question. Why shouldn't we use .cc as a file extension? What is the difference between .cc and .cpp. Please tell us, we are curious minds. Because the website is named learncpp.com, not learncc.com. There's really no difference. If you want to use .cc, you can. Just be consistent. I started learning, or trying to learn c++ like a week ago and I started with this one site, that I won't name but it really sucked. Anyways so far I'm enjoying this one but before I start learning to code in c++ do I need to learn HTML first? Also is using ideone just as good as an IDE, or would you prefer the IDE? HTML has nothing at all to do with c++, you can start with c++. I have no experiences with ideone, judging by a quick glance it doesn't seem to let you choose the compiler or compiler options for your program and I don't see any file management. I'd go with a regular IDE. There are many other IDEs around but these are the major ones which you'll find the most help for should you encounter any problems. You definitely don't need to know HTML. Ideone is an online compiler, and looks pretty limited. It will work for simple programs, may not be able to support multiple files or robust debugging. I'd install an IDE application if that's an option for you. We cover this in future chapters. This just gives you an outline for the process in general. I wanted to know if I could program in C++ without using any IDE. Yes, you can use any editor you like. But IDE's have several functions that make them better (namely, an integrated compiler, syntax highlighting, and integrated debuggers). Most likely you already have everything you need. You have a "browser." A browser is the program that makes it possible to browse and open websites. Right now you are looking at this page in your browser. It is not important which browser you use. The most common are Google Chrome, Firefox, and Internet Explorer. But there are others such as Opera and Safari and they can all be used and they are all free. You might have heard about, or even used, programs such as Microsoft FrontPage, Macromedia Dreamweaver or even Microsoft Word, which can — or claim that they can — create websites for you. Forget these programs for now! They are not of any help to you when learning how to code your own website. Instead, you need a simple text editor. If you are using Windows you can use Notepad. The problem with many of the programs that claim they can create websites is that they have a lot of standard functions that you can choose from. The downside is that everything needs to fit into these standard functions. Thus, this type of programs often cannot create a website exactly as you want it. Or — even more annoying — they make changes to your hand-written code. With Notepad or other simple text editors, you only have yourself to thank for your successes and errors. I started learning from your tutorial today only with great enthusiasm and liking it and enjoying it; because I myself is the proof of the system(way of learning anything). Still I would appreciate your comment in the context. I'm not sure what you would like me to comment on. With websites, there are many programs that exist to help people layout website visually without having to write HTML and CSS. These programs generate the code for you. However, if you want the best level of control, you need to write the HTML and CSS yourself. The C++ core language doesn't include visual elements. So in these tutorials, you'll write all of your own code. Would it be advisable to try designing the solution by writing in a different language (e.g. Python) than what you intend to use for the ACTUAL solution, so you can see how it completely fails? That sounds like a lot of work for a questionable benefit. So no, I don't think I'd advise that. If you're interested in making sure your solutions are robust and error-free, I'd focus your time on learning how to _really_ test your code well. Lesson 5.11 has some tips in this regard.